The Kepler Space Telescope recently picked up unprecedented flickering behavior from a distant star, leading to speculation that—among other things—it might be an alien megastructure. Now, some astronomers are saying it might just be caused by a rapidly spinning and irregularly shaped star. Star KIC 8462852—recently dubbed “Tabby’s Star”—is emitting a transit signature that defies explanation. Normally, the luminosity of a star drops at a consistent rate when an alien planet passes in front, but not Tabby’s star. This object is dimming at irregular intervals and at levels that far exceed anything seen before. Kepler astronomer Tabetha Boyajian and her colleagues suggest that this could the remnants of a planetary collision, or maybe a massive cometary cloud. 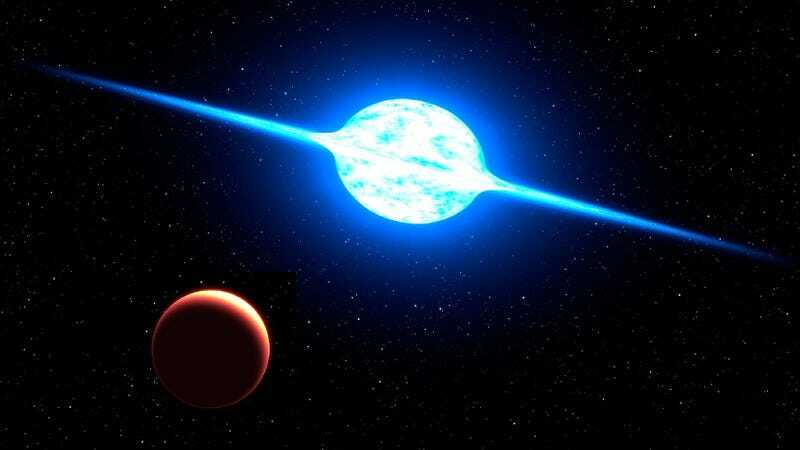 More radically, Penn State astronomer Jason Wright and his colleagues have speculated that it might be an alien megastructure, like a Dyson Sphere. But even Wright admits this is a “perilous approach to science”—one that could lead to an “alien in the gaps” fallacy, and unfalsifiable hypotheses. A number of other theories have been tossed about, but there’s one in particular that’s starting to attract some attention. It’s the phenomenon of gravity darkening and spin-orbit misalignment. Astronomers are indeed familiar with oblate stars. For example, a massive, bright young star called VFTS 102 spins around a million miles per hour, which is about 100 times faster than our own Sun. The resulting G-forces have flattened the star into an oblate shape, producing a disk of hot plasma (see artist’s depiction in top banner). Gravity darkening might be a small part of the puzzle, but it does not explain the features of this star. Tabby’s star does not rotate fast enough to experience significant gravity darkening. That post also suggests that planets could be responsible, but planets are not large enough to produce the observed events, and there are too many events to explain with planets or stars. Apparently Boyajian did consider the gravity darkening hypothesis, but it was rejected given the reasons cited by Wright. However, he admits it might be a “small part of the puzzle.” Other astronomical phenomena could be involved, either known or unknown. Whatever’s going on, this is a significant scientific discovery, and it most definitely deserves the attention it’s getting. Unless, of course, the data used in the Kepler study is somehow flawed or insufficient. Tabby’s Star is currently being studied by several groups, so future analyses are forthcoming.